Johnny Knapp, photographed in his home in 2015. The first time Jez Graham played with Johnny Knapp, about 10 years ago at the Georgia State University Jazz Piano Summit, Johnny played “Just Friends,” a jazz standard with roots in the 1930s that was later recorded by artists such as Tony Bennett, Charlie Parker, Dizzy Gillespie, and Sarah Vaughn. Those performers all have another thing in common: They were all accompanied by Johnny Knapp at one time or another. Bennett, Johnny used to say, wore such a cheap-looking toupee that “the boys in the band offered to take up a collection to get him a better one.” And Parker used to come by Johnny’s pad on 71st Street in Manhattan to jam and to learn simple melodies that he’d later translate into complex bebop. 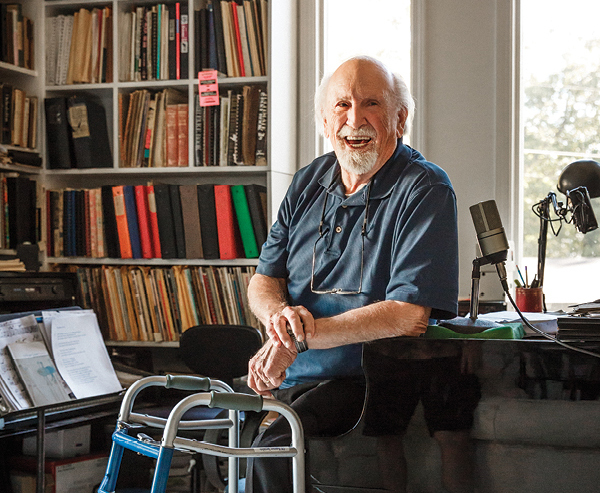 “Johnny had a million stories, and he knew a million songs—an endless flow of songs,” Jez says, remembering his friend and fellow pianist, who died in his Lawrenceville home on November 9, just a few weeks shy of his 90th birthday. Johnny was a working musician for 70 years—the key word there being “working.” He started out as an accordion player but became a versatile pianist. He mastered multiple styles, worked weddings and bar mitzvahs and inside department stores. He knew polkas and show tunes and made steady money in society bands, but he made his reputation in New York jazz clubs and later in Los Angeles. He claimed to hate rock-and-roll but played it as well or better than anyone else, particularly as he got older. Col. Bruce Hampton, whose free-wheeling style of rock and rhythm-and-blues music sometimes delved into avant-garde, called Knapp the “Forrest Gump of music,” because he’d seemingly been everywhere and played with everyone. Jez introduced Johnny to Bruce, who died last spring during the encore of his 70th birthday concert at the Fox Theatre. Bruce hired him for scattered gigs over the past few years, introducing Johnny to a new generation of music lovers. Johnny played that night at the Fox, part of an all-star lineup of musicians that included Derek Trucks, Susan Tedeschi, Chuck Leavell, and Jimmy Herring. Just before Bruce went back on stage for the last time, he spoke with Johnny, who was sitting in his wheelchair offstage right. Jez, Johnny, and Bruce would meet every Tuesday for lunch, an event that quickly became a weekly gathering of seven or eight people, mostly musicians, consuming pancakes and bottomless pots of coffee at an IHOP in Lilburn. “I think that I’m proudest of getting Bruce and Johnny together, and the friendships that grew from that,” Jez says. I agree, because that Tuesday lunch is how I met Johnny. Once Bruce Hampton met Johnny, almost everyone he knew met Johnny too, and a caring community quickly grew around the aging piano player, filled with other musicians, promoters, and writers (like me) who at first wondered how they’d never heard of this guy, and then got sucked into his orbit. He had a squeaky Brooklyn rasp and a supportive, gentle nature. He could also curse like a sailor and be a ball-buster. He was an intuitive teacher, who seemed to know what each student needed, whether it was tough love or kind affirmations. A few weeks ago, Nancy, Barbara, and most of Atlanta’s jazz community squeezed into 800 East Studios for Johnny’s 90th birthday celebration. His health had been declining since a heart procedure last summer, and neither he nor the party organizers were confident that he’d live to actually see his 90th birthday. Johnny spent most of the party with his tired head drooping on his chest, or his eyes closed. To the casual observer, he looked terrible. But if you looked closely, he was immersed in the music. As each artist performed, I kept watching him. He played air piano on his knees and tapped his feet in rhythm. When almost everything else inside him was shutting down, he was still present with the music. Johnny always felt ageless to me, like he lived many lives in the normal human span of years. But when I think of Johnny at 90, I think of baby Johnny being diagnosed with polio, and how it terrified his parents, who came to New York from Czechoslovakia and spoke very little English. When I think of Johnny at 90, I think of all the people he’s known, the people he’s worked with and influenced, and the people who influenced him. He knew Miles Davis and Louis Armstrong. He accompanied Billie Holiday and Barbra Streisand. He helped playwright Bob Merrill write Funny Girl and played countless Hollywood wrap parties. I think of Forrest Gump. When I think of Johnny, I’ll always think of Dee, his wife of 50-something years. They were a couple steeped in art and music, who fell in love in the New York jazz scene at its height. I think of how, after Dee died in February 2015, Johnny was stunned. “I was supposed to go first,” he said. I think of how he was a recent widower living alone in their house, annoyed with Dee for leaving him, and of the night shortly after she died when he visited the Velvet Note and his friends asked if he wanted to play. He didn’t, at first. It’s all there on YouTube, Johnny Knapp’s furious, heartbreaking rendition of “Softly as a Morning Sunrise,” his tribute to Dee, his face intense, even as he imagines his dancing wife and plays the dancing rhythm, all of it the truth. I also think of one of his favorite quotes, a line from the poet Sidney Lanier: “Music is love in search of a word.” I think of the love Johnny spread in 70 years of playing. Jez wanted to return some of that love the last time he saw Johnny, a few days after the 90th birthday celebration. “I played ‘Just Friends’ for Johnny, and he loved it. He was tapping his feet, and he clapped when I was finished. It was so good to see him that way,” Jez says, then pauses a few seconds. Jerry Grillo is a freelance writer and works at Georgia Tech. He wrote about Knapp’s life and career in our December 2015 issue and written for Atlanta about many local musicians including Col. Bruce Hampton, Jimmy Herring, and Joe Grandsen.